I hate to sound like a broken record, but as a divorce mediator, it's hard to figure out why divorce mediation isn't the option everyone chooses in a divorce! Here's an informative article from newsday.com about divorce mediation and the unfortunate fact that New York remains one of the worst places to get divorced. The salacious and rage-fueled divorce trial of Christie Brinkley and Peter Cook may have made for good gossip, but experts say it is also a perfect example of everything divorce shouldn't be: expensive, public, bruising and adversarial. Aside from the cameras and commentary, experts say the Brinkley-Cook trial, which ended last week after the parties settled out of court, is emblematic of divorce in New York, which lags behind dozens of states when it comes to offering alternatives to knock-down, drag-out courtroom battles. From custody to mediation to financial issues, experts say the way New York State handles divorces makes the process far worse for both parties. Andrew Schepard, a Hofstra University law professor who specializes in issues surrounding divorce, said New York's method of handling custody, for instance, is among the most adversarial in the country. "It puts a premium on digging up dirt on the other party," Schepard said. "It puts a premium on each side saying, 'I am better than the other parent.' That is how parents 'win' custody. What they should be saying is, 'What are my children's needs during this divorce?'" In the area of mediation, New York lags behind most states. Judges in the state do not have the power to order couples into mediation, which can reduce costs, create less divisive outcomes and help spouses maintain better relationships with their children and each other. Courtroom alternatives, such as early-settlement panels and giving extra attention to high-conflict custody cases, are available only to couples who live in counties with pilot projects. Statewide, the state's Office of Alternative Dispute Resolution has an annual budget of $5 million in a court system that spends $2.4 billion a year. But though change is not happening as quickly as many advocates would like, it is happening. For the past two years, Nassau County has offered a program called "Children Come First," in which couples whose divorces are identified as acrimonious are evaluated and referred to services such as counseling and parent education. If they can't settle their differences with the increased oversight, a trial to resolve child custody disputes is held within 30 to 45 days. Suffolk County recently began offering voluntary mediation, in which spouses are referred to approved mediators. "It gives the parties the total control over the proceedings, because they can then decide and guide the whole proceeding through the neutral mediator," said Suffolk Administrative Judge H. Patrick Leis III. "Litigation is definitely a difficult way to do it, because afterwards one is a winner and one is a loser." Nassau State Supreme Court Justice Robert Ross, supervising judge of the county's matrimonial center, said 147 couples have gone through the pilot model court since its inception in October 2006, and 80 percent of those cases settled within four months - compared with the one to three years that such contentious cases typically take. In her 2007 State of the Judiciary speech, New York State Chief Judge Judith Kaye called Nassau's program an "unqualified success." Focusing on custody disputes at the outset, rather than settling them at the end of a yearslong process, keeps angry spouses from using children as weapons in their negotiations, Ross said. Once the custody issues are settled, he said, financial matters often fall quickly into place. "And that's leading to settlements at an unbelievable rate," he said. "What you're doing for children now who don't have to be exposed to the acrimony of a divorce that's pending for two years, it's a blessing." Robert Mangi, a divorce lawyer who chairs the Nassau County Bar Association's matrimonial committee and has represented litigants in the new model court, said that his clients appreciate separating issues involving the well-being of their children from appraisals of a house or a business. "Ultimately what we're trying to do is to avoid the circus that you see in the Brinkley case," Mangi said. "If we can avoid a trial where all those issues have to come out, that's a good thing." But despite some strides, many experts and divorce reform advocates find that change has been spotty, incremental and slow. In more than a dozen other states, couples are required to try mediation before seeing a judge. In New York, only a handful of counties offer court-sponsored mediation, and even then it is optional. Leis said some lawyers mistrust mediation because of past encounters with untrained or unprofessional mediators, who are not licensed or regulated. To counter this, he said, Suffolk judges refer couples to a list of approved mediators who have been trained by the state Office of Court Administration. "It's like trying to turn a battleship," he acknowledged. Lisa Hicks Yackel, executive director of the New York State Dispute Resolution Association in Albany, said her group has been advocating unsuccessfully for five years for state legislation that would require couples with custody disputes just to hear about mediation. Some lawmakers are opposed because women's advocates fear wives would get steamrollered. Schepard said he views the Brinkley divorce trial as a lost opportunity. "It would have been absolutely wonderful for the judge to be able to order these people to mediation or parent education," he said. "Think of the message that would have sent to the public, instead of all the salacious details." A 2-year-old pilot program in Nassau County that speeds up custody decisions in highly contested cases. Couples meet with a parenting coordinator, who recommends services such as parenting education or anger management to encourage settlement. Spouses who can't settle have an expedited custody trial within 45 days. About 80 percent of the 147 families who came through the program have settled. Recent Suffolk County initiative in which couples, when appropriate, are referred to a list of court-trained mediators to help them try to work out their differences outside the courtroom. A Collaborative Family Law Center, in which divorcing couples and their lawyers work together to reach a settlement with as little conflict as possible, is under construction in Manhattan. Opposition from the National Organization for Women, which says its goal is to protect women who may be at a financial disadvantage in the divorce process. Opposition from conservative religious groups such as the New York State Catholic Conference, the lobbying arm of the Catholic Church. The lack of an organized constituency in favor of divorce reform. I have pasted below the full text of a short and sweet article from the The Orlando Sentinel about how and why mediation works and why you might want to give it a try. But first, I'd like to provide an excerpt about the Charles Dickens' novel, The Bleak House, which is referenced in the Sentinel article, to give you the appropriate context for the Sentinel article. A contested inheritance sparked the surreally drawn-out case in Charles Dickens' Bleak House. By the time Jarndyce and Jarndyce was over -- generations after it began -- legal costs had devoured nearly the whole estate. Dickens wrote the novel as a critique of the British judicial system, whence the United States inherited much of its law. More than 155 years later, much remains familiar about the old Dickensian dispute. But today, there is at least one way to avoid the horrors of Jarndyce and Jarndyce: mediation. The process involves a neutral party, usually an attorney, hired by you or your lawyers to steer negotiations with the other side. It's confidential and binding, and though it's not always successful, it usually works in less time and with lower costs than going to court. "I probably settle 90 percent or more of my cases in mediation," says Richard West, a marital and family lawyer and mediator in Orlando. "Without this, the court system would be hopelessly bogged down." West says that in mediation, parties in dispute can fashion their own solutions to problems rather than rest their fates in the hands of a judge. In Orange and Seminole counties, West says, divorcing couples can't even set a hearing without trying mediation first. "If it doesn't work," West said, "you end up in front of a judge anyway." Adrian G. Uribarri can be reached at auribarri@orlandosentinel.com or 407-420-6269. The San Francisco Chronicle ran an informative and timely piece this Sunday on the benefits of mediation to resolve conflicts in the workplace. This is timely given the difficult economy we are facing and a resulting lack of job security for most of us which might prevent employees from speaking out about conflicts that affect their work. Here's an excerpt: "So what are employees supposed to do when they have problems with their supervisors but are scared of the potential repercussions of complaining about their bosses and don't want to see an attorney? One answer is mediation, a process that lets individuals resolve their problems with the help of a third-party facilitator. Unlike arbitration ... mediation relies on a wide range of techniques to identify and fix problems. These can include face-to-face dispute resolution sessions, exercises to overcome interpersonal conflicts and even novel techniques to get people behaving in new ways. "If this sounds too "out there" for the real world, Schear points out that companies such as Coca-Cola have implemented an internal alternative dispute resolution program, and employers such as Home Depot are talking about creating similar programs ... Mediators can provide a way to handle these kinds of disputes fairly." Doctors and lawyers in Montgomery County are doing something unusual: working together. Members of the county's bar association and medical society, along with Abington Memorial Hospital, tomorrow are launching a pilot project they hope will keep more malpractice disputes out of court. Lawyers and doctors will work in teams to mediate conflicts between patients and the hospital or doctors. The hope is that the new approach will resolve problems more quickly and humanely, without the demonization of both sides that can occur in malpractice battles. Whether it will save money remains to be seen. Project leaders say that is not the primary goal. John J. Kelly, Abington Memorial's chief of staff, said he wanted to avoid the "harshness" of litigation. "At the end of the day, I think everybody walks away feeling like it's a much more productive process, and it's a healing process," he said of mediation. "I think litigation makes everything so much more painful for everyone, and I'm not sure healing ever occurs." Planning for the project started three years ago after a nudge from the state Supreme Court. It encouraged counties to look at alternatives to traditional court battles as doctors threatened to leave Pennsylvania because of skyrocketing malpractice-insurance rates. Not much has happened elsewhere in the state, but doctors and lawyers here pursued it because "there's got to be a better way to do things than the way we've been doing them," said Mark Lopatin, a rheumatologist, who led the medical society's part of the effort. People on both sides say the current system is emotionally draining, even when you win. "Clients hate courtrooms," said Robert Morris, president of the Montgomery County Bar Association. "I haven't ever had a client that wanted to get in the witness stand." The project deals with unhappy patients and their families through a two-step process. In the first, doctors and nurses at Abington have been trained to listen to such patients and explain what happened in as much detail as possible. Project leaders say many people who sue do so primarily to find out what happened. If that is not enough, patients can move to mediation, a process that helps them hammer out a settlement with their doctors. The mediator shuttles between the sides, bringing their positions together. Unlike a judge or arbitrator, the mediator does not decide the case. Instead, the patient and doctor - or more likely their attorneys - determine an acceptable outcome. Usually that involves money, but patients also often want an apology and assurance that steps will be taken to prevent future mistakes. If the sides are still fighting, patients still have the option of going to court. In this region, Drexel University College of Medicine's doctors have the longest-running mediation program. Theirs often uses a team approach, pairing lawyers who typically represent patients with those who defend doctors. Abington's new program creates even more unusual teams. A lawyer with health experience will be the lead mediator, and a doctor will be his "medical partner." "It's precedent-setting, this project," said Jane Ruddell, a former health-system lawyer who now runs a company devoted to alternative dispute resolution. "It's really trying to change a culture." Ruddell ran a training session last week in the bar association's Norristown office to train about 30 doctors and lawyers to be mediators. Many of the lawyers had previous experience with mediation, but the daylong program was an eye-opener for the doctors, who understood for the first time how hard and time-consuming it was to sort through strong emotion and find common ground. In a training exercise, the doctors and lawyers were split into groups for some role-playing. Abington Memorial obstetrician-gynecologist Robert Michaelson played the mediator for one. The bar association's Morris was an angry woman with cancer, and Mark Pyfer, president of the Montgromery County Medical Society, was her even angrier husband. The patient in the case had had foot pain, which the doctor thought was caused by a pinched nerve. The patient decided not to have surgery the doctor recommended and later lost part of her leg after the cancer was discovered. Michaelson got into trouble almost immediately, waiting too long to separate the warring parties. He ran out of time without getting close to a settlement, but Morris, who is a trained mediator, and Pyfer, a novice, proved a good team. "I thought she was negligent because she never paid much attention to me," Morris said petulantly. "Dr. Reynolds can say she's sorry, but I don't think she has any idea what it's like to go through life with one leg," Pyfer chimed in. Then he asked for $10 million. Doctors came away from the experience understanding why the lawyers will take the lead in mediations, at least in the beginning. "The most striking thing about this was . . . how difficult this is," said Lopatin, the rheumatologist. Frank Murphy, a lawyer who attended the training, said it might be harder than the hospital anticipated to avoid malpractice filings and to persuade lawyers to be totally open with one another. Legal-filing deadlines, strategy, and payment agreements give lawyers an incentive to file in court and, sometimes, to stretch out the proceedings. Advocates of mediation say it is often cheaper than court because there are fewer exhibits and medical experts to pay for. Participants usually sign confidentiality agreements, a step that supporters say spares everyone embarrassment. The downside of the secrecy is that mediated cases create no legal precedent and leave no public record. Monetary settlements are reported to the National Practitioner Data Bank. But its information is available only to hospitals and professional groups, not consumers. Some doctors also worry that mediation will be just one more step on the way to court. That has not been Drexel's experience. Of 40 cases that have gone to mediation, only three were unresolved. Those involved in the Montgomery County experiment say it is more likely to give patients what they really want: early action, an apology, and information. "Patients want answers. That's what they want more than anything," said Sheila Stieritz, a former director of patient safety at Abington Memorial, who consulted on the pilot project. "And if it's something really serious, most patients want it not to happen to anybody else." From the Tucson Citizen: While some parties are relieved to be introduced to mediation, Quiros said, others continue to balk. "People often feel mediation is touchy-feely or they give up control," Quiros said. "It's quite the opposite. Even though there is a third party facilitating, the control of the outcome is completely in the party's hands - there's no judge, no jury." From the Pittsburg Post-Gazzette: Mediation is private and confidential. Most often the mediator is an attorney, knows neither party and has no stake in the outcome. Nothing said to the mediator in mediation is permissible in a court of law. 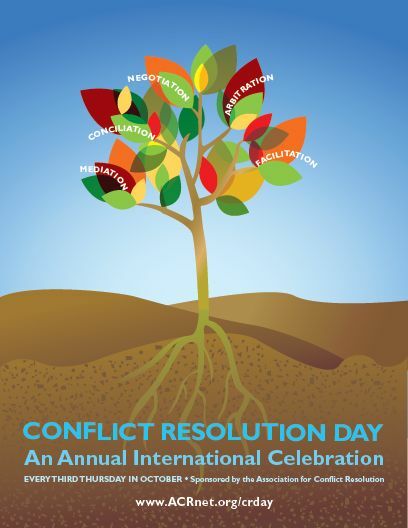 From the Harrisonburg, Virginia Daily News-Recorder: Every March, Virginia celebrates one of the most effective, inclusive and thoughtful methods of resolving conflict - mediation. Mediation is a way for people to come together and work things out. Trained mediators help people to bring issues to the table and to sort them out...Mediators simply guide the conversation without taking sides or telling participants what to do. Mediators help people through the stress, anger, confusion and suspicions of the other party to find solutions. Business Day Interview of mediator Wahida Parker:  At Equilaw we believe that it’s multi-tiered dispute resolution - that’s a phrase that was coined by Professor Butler. What we mean is it’s one step in the process to resolving disputes - if a mediation is not settled, and our statistics show that 80% of matters that are mediated on are settled at the mediation  the remaining 20% then can elect either to go to court, or to go to arbitration. That is why we say it’s a multi-tiered dispute. If you say alternate that means it’s the other choice - a completely different choice - and we don’t agree with that stance. And, from the Edwardville Intelligencer: "...people come out of [mediation] having controlled their fate and agreeing to something, rather than having a jury decide. A lot of times people think the jury was wrong, so at least [in mediation] the parties decided." Mediation continues to grow in popularity, particularly in family related disputes like guardianships and conservatorships. I have pasted below the full article on Mediating Elder-Care Disputes from the Wall Street Journal. It's hard enough for families to navigate the complicated and emotionally charged decisions related to elder care when everyone gets along. Throw in a family with tensions or outright hostility and it's no wonder that disagreements sometimes end up in court, an expensive proposition that can easily magnify divisions. Another way to handle these problems is growing in popularity: mediation. A mediator is sometimes brought in at the order of a judge seeking to settle a dispute without taking it to a jury. But elder-care practitioners are urging more families to take the step voluntarily, especially in disputes over how to handle guardianship for family members who can no longer care for themselves. Mark Dennen's family was embroiled in nearly two years of litigation centering around guardianship for his father, then 92 years old, when a judge ordered the case sent to mediation. "Everybody brings in all this emotional baggage and the mediator helps bring things into focus," Mr. Dennen says. "It's designed to get to a solution." The mediation brought the legal battle to an end just months before Mr. Dennen's father passed way. The basic idea behind mediation is that a dispute is resolved through an agreement among the parties, instead of a resolution mandated by a judge or negotiated by attorneys. The role of the mediator -- usually an attorney or someone with a background in social work -- is to facilitate communication and informed decision making. The cost of mediation varies around the country. In big metropolitan areas, it can easily cost $300 to $500 an hour, although it's possible to find dispute resolution centers that are significantly less expensive. Robert Rhudy, a former legal-aid attorney turned mediator, has championed the use of the practice to resolve elder-care disputes in Maryland. "In mediation, everybody who is affected by the situation has an opportunity, in a neutral and confidential setting, to tell their story," he says. Whenever possible, that includes the elderly family member. The mediator can help ease communications among family members for whom the elder-care dispute may reopen decades-old wounds. "Things like 'Mom always liked you better' and brothers and sisters who haven't gotten along since they were three years old come to the fore," says Mr. Rhudy. Common candidates for mediation are disagreements between family members who live far away and a sibling who lives closer to the elder and may have a different assessment of that person's needs. Sometimes the disputes are between children and elderly family members who have their own view of where they should be living and who should be caring for them. Mediation can be used to settle disagreements over living arrangements, how finances should be handled, who should be granted power of attorney, and even visitation rights among squabbling siblings. Agreements often specify the kinds of information, especially financial and medical updates, that will be provided to family members who live far away. The personal nature of these disputes is what makes mediation helpful, says Forrest Mosten, a Los Angeles attorney who has been a mediator for nearly three decades. "The remedies that a court offers are very limited...but in mediation, an apology may end the dispute." Mediation also allows for informal or even interim solutions, Mr. Mosten says. "You can try things out and see how they work," he says. For example, instead of immediately pursuing a formal guardianship, one child could become a co-signer on a bank account. "If that works, then you don't have to go any further." There are some times when mediation alone isn't sufficient, says Nina Weiss, an attorney and mediator in Princeton, N.J. If a guardianship is in order, for instance, that must be ordered by the court system. The mediation process for elder-care decisions can -- and most say, should -- bring in experts such as social workers, estate-planning specialists and health-care professionals who would typically be called upon as part of a court case. "The courts will recognize the same issues....It's just that you avoid the expense" of litigation, says Joseph Mahon, an estate-planning attorney in New Jersey (who isn't also a mediator). One challenge facing families looking for mediation help is that there is no formal licensing or credentialing for elder-care mediators, notes James Bergman, a co-director at the Center for Social Gerontology, an Ann Arbor, Mich., nonprofit group that has been a longtime advocate of elder mediation. "Anyone can hang a shingle out and say they're an elder mediator," he says. But there are plenty of experienced mediators, so it's largely a matter of tracking down those with experience in the area and, importantly, a mediator the parties feel comfortable with. One place to start are local nonprofit mediation groups, such as the Montgomery County Mediation Center in Eagleville, Pa., which can generally be located online. There are also state organizations, such as the New Jersey Association of Professional Mediators. Some states have lists of mediators officially approved by their courts. And online, the Association for Conflict Resolution offers the public the ability to find mediators from among its members at acrnet.org. Also online, Mediate.com and EldercareMediators.com offer names of mediators (who pay small fees to be listed). Click here to go directly to this WSJ article.